Supporters raise placards outside a court in Hong Kong, April 9, 2019. A hearing for nine Hong Kong pro-democracy activists convicted for their involvement in the city's 2014 Umbrella Movement protests will take place on April 24. The original architects of the protest, Benny Tai, Chan Kinman and Reverend Chu Yiu-ming, were convicted Tuesday of conspiracy to commit public nuisance. The three stood trial alongside six other leaders from the Umbrella Movement, including sitting legislators Tanya Chan and Shiu Ka-chun. The group has been named the “Umbrella Nine” by local media. Eight members of the group, with the exception of Chu, were found guilty of incitement to commit public nuisance. Five were also found guilty of incitement to incite public nuisance, a little-used common law charge of convincing others to encourage protest. The original trio, however, were acquitted on this charge. Judge Johnny Chan said in his ruling that the verdict would not have a chilling effect on Hong Kong’s protest movement, as had been argued by the defense. Sentencing had initially been delayed until Wednesday but court employees said it could extended into Thursday because defendants submitted mitigating evidence to offset a possible lengthy prison term. The defendants were charged under common law, rather than with statutory charges, which means they face a sentence of up to seven years in prison as opposed to several months, according to a report by the international rights monitoring group Amnesty International. Chan and Tai have chosen not to submit any evidence during sentencing. Their lawyer said his clients only hoped the court would show leniency to 75-year-old Chu, who suffers from a number of medical conditions. Chu, who gave a lengthy speech in Cantonese in his defense, was greeted with enthusiastic applause as he departed the West Kowloon Magistrates’ Court accompanied by family members. For much of the day, the courthouse and its grounds were filled with well over 100 family members and supporters of the defendants, many of whom attended the 2014 democracy protests. One supporter, Tsang Kin-shing, said the ruling marked a sad day for democracy in Hong Kong. 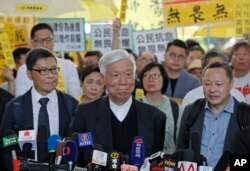 Occupy Central leaders, from right, Benny Tai, Chu Yiu-ming and Chan Kin-man speak before entering a court in Hong Kong, April 9, 2019. "Over the past few years, the Hong Kong government has used relentless pressure to try and break up the democratic movement. The ruling is a tragedy for Hong Kong. I hope the people of Hong Kong will rise up to fight for the democratic and human rights we deserve," Tsang said. The courthouse was also flanked by protesters, many of whom were holding the red flag of China, who said they hoped to see the nine democracy leaders convicted. Kenny Po Chun, president of Defend Hong Kong Campaign, said the court's decision defended the rule of law in Hong Kong and the protection of citizens' life and property. "The 79-day riot of Occupy Central kept many businesses from operating. Police officers were injured and bloodied. Citizens were beaten by the rioters. Those things made the people of Hong Kong very angry. The initiator of Occupy Central, Benny Tai, must take responsibility," Po said. Amnesty International also quickly criticized the guilty verdict, calling it a“crushing blow for freedom of expression and peaceful protest” in a press statement. Ahead of the trial, Tai told VOA that he did not regret his role in the protest although it had failed in its aim of securing universal suffrage in the election of Hong Kong’s chief executive. The protest, held in 2014 between September and December, is still seen as a watershed moment for Hong Kong. It led to a surge in anti-China feelings in the autonomous Chinese city. “Yes we could not change the system but I think we did awaken a lot of Hong Kong people about the significance of democracy, civil disobedience, as a way to strike for democracy,” he said. Tai also said, “Part of civil disobedience is to accept the legal responsibility” of possibly going to prison for political actions.